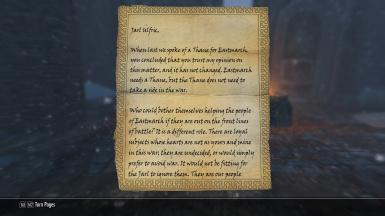 Thane of Eastmarch does not work. 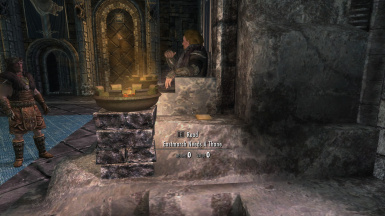 Read the note, completed Blood on the Ice, helped five people, re-read the note, got the Return to Ulfric, but talking to him only brings up the vanilla dialogue, no matter how many times I talk to him. Reading the note (near the throne) once more did not work. Installed this after I was done with the main quest line, faction quest lines (except thieves and assassins), and all side quests from Skyrim, and it works perfectly. Every time I enable the ESP, my FPS drop from 60 to 4 FPS. Does anyone have an idea what other mods can conflict with this? nearly literally any mod could do that. but not this one. that doesn't make *any* sense. 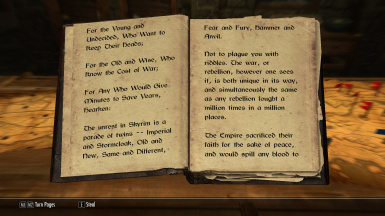 If combined with "Not so Fast - Main Quest" (which allows the removal of the dragonborn handling negotiation (season unending)) does this mean I can remove all involvement in the civil war? Or does this mod cancel "Season Unending" itself? I was wondering about that one too... about Season Unending - does it still happen? Or can it be skipped? This mod by itself does not cancel out Season Unending. I installed "Not so Fast" after I realized this, and used the in-game controls to cancel the negotiations; this worked great. I did get a "Completed: Season Unending" message as I was learning the Call Dragon shout from Esbern, but there were no issues or bugs. So it looks like installing both mods allows you to remove all involvement in the civil war! Working perfectly! Thank you! I hate the CW quests, they are horrible and so damn buggy. Every time I've tried to get through them, I'd have to look up some work around or another. Not this time. Nope. Nu uh. I've HAD it with that damn quest! LOL! Thanks so much! Since i got it i only had to reload an old save once during the entire questchain in only one of my playthroughs where if i played without i had to do it multiple times, but yes the CW questchain is one of the buggiest and most broken in the entire game. Might even be the buggiest. Yes, I have the USSEP patch. Never play without it. However, I did find a really easy 'work around' (console code) which helped with the CW quest. I'm usually sided Imperial, and Rikke gets stuck where she won't let me report in. I found that doing 'moveto cwobj' worked about every time to get her to let me report in. OF COURSE I didn't find this until recently, and it so far it's always worked (I'm sure there may be other times it won't). But having this mod to just say "Nope" to anything relating to CW is pretty damn nice. 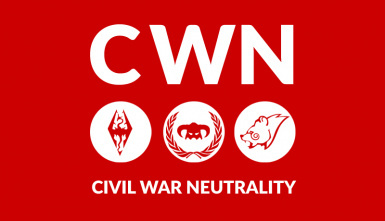 If i download this mod, will i still be able to pick a side in the civil war later on or is the neutrality permanent? So wait, what if I have this mod for playthroughs where I dont want to be in the civil war, but other playthroughs where I do? Is there literally no option to join the civil war with this mod on? 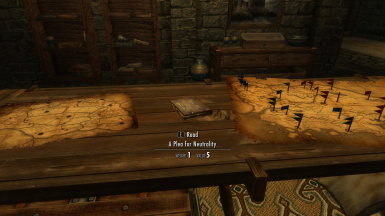 "To clear your journal of recruiting entries, go to the map table in Dragonsreach and read A Plea for Neutrality"
So with this mod on I think you can still join a side.... I think. 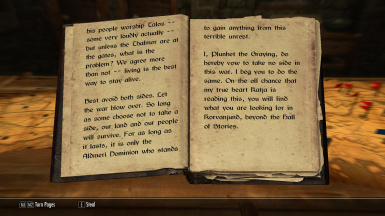 I had this mod installed, and when I got the quests to join whichever side, I just read the book found in Dragonsreach (which I then took with me and kept it in my house). 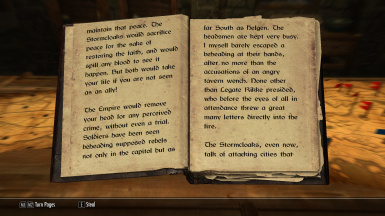 Again the quest to join a side popped up, all I had to do was re-read the book. I think if you later wish to join a side, just don't re-read the book. At least, that's a theory. 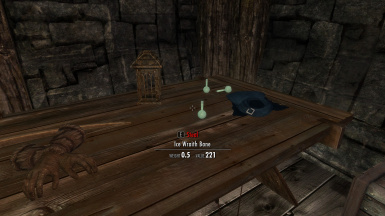 Would this conflict with the mod Stormcloaks for Good Guys > https://www.nexusmods.com/skyrimspecialedition/mods/12839 ? I know it changes some interactions related to joining the stormcloak side of things. Tho actually it may not matter as part of why I always avoided the Civil War was because in various ways i felt both sides had valid points and then now knowing about the Thalmor in more detail I very much like the aspect of finally getting a mod like this one for SSE so ignore me. But whilst I'm here I'd like to say THANK YOU for the time and effort that probably went into this mod :) Much appreciated. For fucks sakes this was driving me crazy. I wanted to be thane of every city, but only now do I have the neutral option to do it. Thanks. I always f***ing found it annoying when the game forced you to take only one path or at best, two paths to a major questline and offered nothing else. Good on you mate for finally doing what obviously needed to be done. I have always wanted an option 3 where the Dragonborn can become leader of all four guilds and use them to become a third army to put an end to Stormcloaks AND Imperials alike. We all know that deep down, Skyrim belongs to The Dragonborn. Really? I've always felt that Skyrim belonged to its people...*all* its people. My DB has to spend far too much time running things as it is. 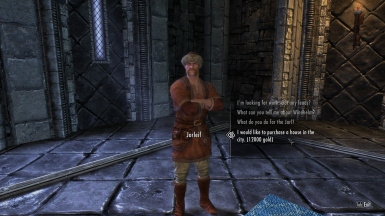 The mod you're looking for is "Become high king of skyrim"
Personally I want to do this quest line. I always rp a good aligned dragonborn and I think that a being that kills Aldiun, harkon, forces miirak to serve their will, harbinger of the companions, arch mage of the collage of winterhold, thane of every city, 100 skill in every magic skill, and has gear so fully enchanted and smithed that they are effectiely immortal would take over skyrim. 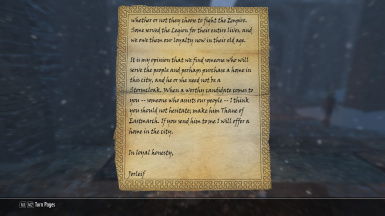 Not for power, but to say clearly and specifically f*** YOU t o the thalmor, give dunmer better living conditions and lower taxes across the entire province, give to poor and adopt all the children I can get my mits on. All things which I have done. Hello. I was just curious about what happens to the civil war if the Dragonborn does not take a side. Will it trigger on its own, will the battles happen? Can anybody explain without too many spoilers? Thank you. Simply put, no. As in, the Civil War questline quests and events won't occur, there'll still be a civil war, but you won't have stuff like the Imperial or Stormcloaks winning.